In the political and societal tumult of the 2010s, most modern art endeavors to make a serious or provocative statement. The turbulence we experience with every fatal event, natural disaster, or political surprise renders us fatigued – an exhaustion which doubles when the movies we watch, the songs we listen to, and the art we enjoy only further examine the issues. 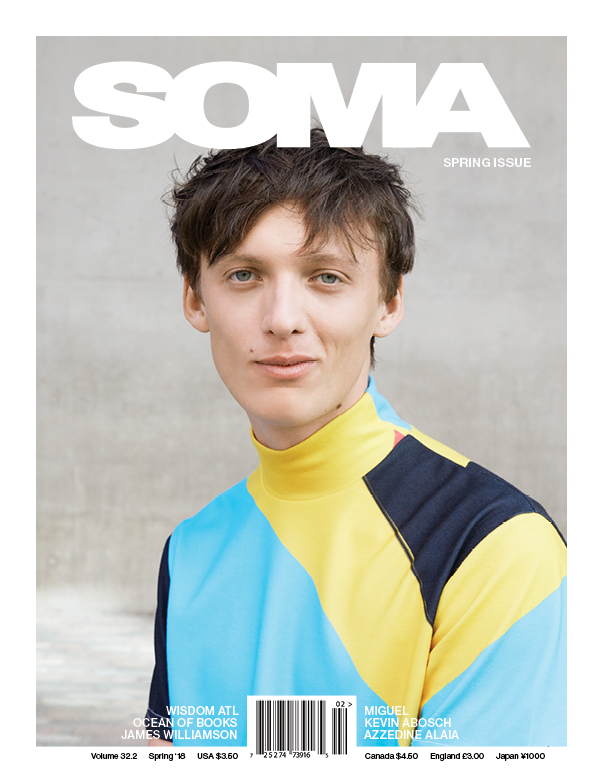 In this, the era of “smart art,” we are often first exposed to new artists online rather than in person; the art we once enjoyed in quiet museum halls and quaint galleries has now been buried between news, social media fodder, and our latest emails from the office. The art that dominates our news and social feeds is often the well-liked instead of the truly loved. When was the last time something online felt new? What if, among the tired selfies and overdone #foodie snaps online, there was an artist you could follow whose work would just make you feel happy – no strings attached? 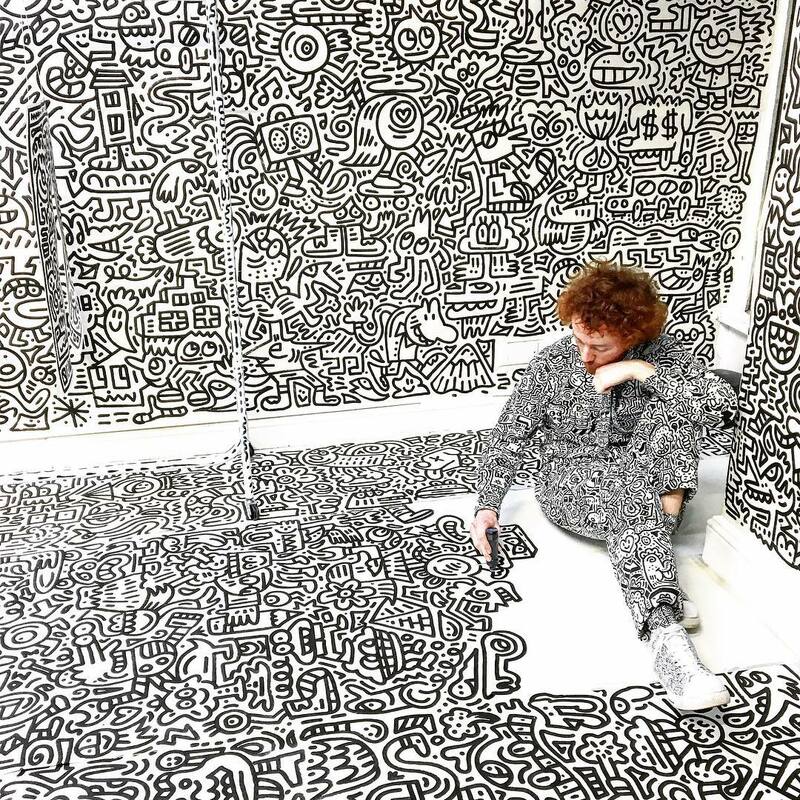 Mr. Doodle – real name Sam Cox – is a budding English artist whose “graffiti spaghetti” doodles do just that. His work is recognizably his own; a body of namesakes. He develops jaunty characters and doodles them into a layered maze of teardrop shapes, rogue lines, and jubilant loops. 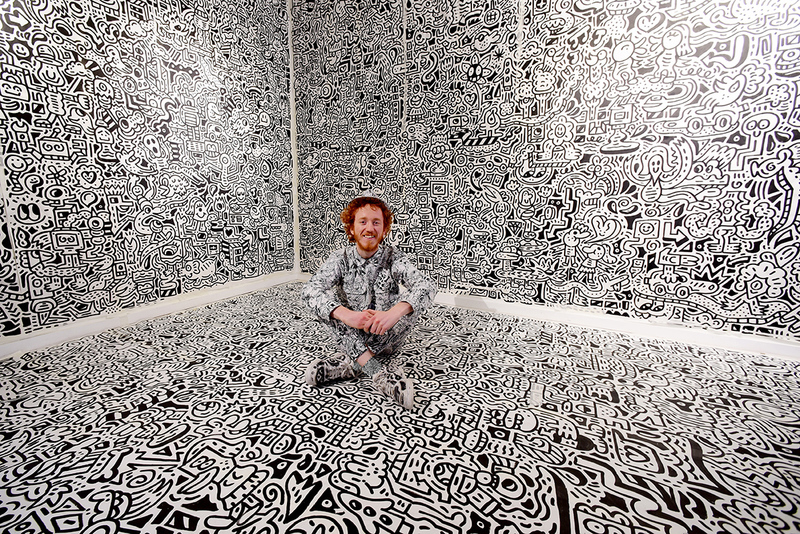 Mr. Doodle’s work encompasses the monochrome mess of Pollock, embraces the diminuitives of Monet, and harkens back to the post-popart of the 1980s in Keith Haring’s work. But, forsaking all of these artists and any other inspirations you might see floating within his work, Mr. Doodle is inspired most by Doodleworld – an alternate universe where everything and everyone is a menagerie of thick black lines and spritely repose. However, where we may envision doodles resting in the margins of class notes or scrawled at the bottom of a shopping list, Mr. Doodle’s work travels. Not only does he doodle on paper –sometimes for an audience in videos online – but he has also put his art onto furniture, walls, vehicles, skateboards, and other 3D spaces which makes his doodles unique to other artists who share a similar medium. His work has been everywhere and on every type of surface so much that he refers to it in his Modus Productions documentary-biopic as “a growing, drawing virus” which spreads and eats up all the white spaces available to him. Fascinated by his ingenue and approach to expression, we sat down with Mr. Doodle to learn more about the development of his work and the story behind the Mr. Doodle universe. Is there a period of history, cultural movement, or era in art that informs or inspires your work? I wouldn’t say there is anything in particular. I loved the video games and cartoons I watched that were around during the time I was three years old and after. So, pop culture from the late 90s to early 00s were hugely impactful to my work. I also like hieroglyphics and Mayan art. I think there is definitely a link to my work there. I like single mark-making with no tones or layers. To whom does your artwork speak? What does it say? Are there any interpretations you hope an audience can contrive from your work? I hope my artwork speaks to everyone. I don’t want it to say so much as it should just make people feel happy when they look at the characters. There are sometimes hidden things but I steer away from heavy issues because I want my work to be away from the troubles of life. Your recent work looks very similar to Keith Haring’s work. Is he an artist that inspires you? Do you feel your bodies of work are similar or reminiscent of one another? How do you feel about the colorful take on doodling in Haring’s portfolio, versus your own monochromatism? I think Keith Haring was a great artist and it is nice to hear you can see links in my work. However, my work is inspired by Doodleworld -that’s what I look to express and share in my doodles – rather than someone else’s vision. I personally prefer to make monochromatic doodles because the most important thing to me is the lines and the making of the world, rather than adding colour to that world. Can you speak to the challenges of doodling on 3D structures? How much does your work change when it exists on other surfaces besides paper? How much do the corners of walls and curvature of furniture limit what you do? 3D can be tricky but it is a fun challenge. The doodles sometimes have to be compromised if they’re in a corner or on a ceiling or difficult surface. You quickly learn what is most important about the doodle that needs to be made and have to make decisions within the limitations, by trimming down details and sticking to what makes characters and doodles recognisable. What would be your dream doodle? If you could make your mark on any building, see your doodles worn by any person, or incorporated in any place – what would that be? I would want to doodle over a whole town. With cars, pavements, roads and whole buildings covered in doodles. I’d love to doodle a whole London underground station, from floor to ceiling, that would be awesome.